It has been a while since any Bossier gardens have been showcased on a garden tour. 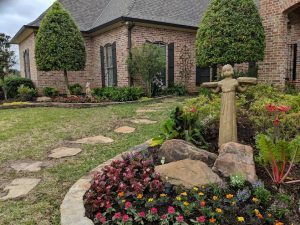 That’s why it’s extra special that there will be four Bossier gardens featured in the 2018 Northwest Louisiana Master Gardeners Garden Tour. This is one of the organization’s largest fundraisers for the year. The spring tour, “Le Tour des Jardins” will take place on May 12 from 10 a.m. to 5 p.m. and May 13 from 1-5 p.m. Guests will have a chance to walk through the gardens and see the amazing work that garden owners have done. Master Gardeners spokesperson, Michele Wiener, is very thrilled that they were able to include gardens in Bossier for this year’s tour. The Master Gardeners is a non-profit organization serving the community since 1998. They are a division of the LSU Agcenter and strive to educate the public about gardening and engage the community in horticultural pursuits. Being able to represent Bossier on the tour was a great honor for Bossier resident Ford Stinson III. His garden on Lafitte Lane has Meyer lemon, apple trees, plum trees, pecan trees, pear trees and mulberry. But his real passion is daylilies. Ford is an expert daylily hybridizer raising 2,550 daylily plants. Stinson says he hopes people will be inspired by his garden to experiment with integrating other plants and not just shrubs into their gardens. Another garden featured on the tour is the Heritage Village garden located in Benton. 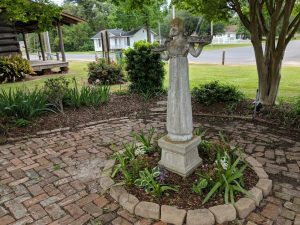 A former Master Gardeners’ grant recipient, Cypress Area Garden Club, is being featured this year for their project maintaining landscaped grounds surrounding Heritage Village located at 414 Sibley St. There are historical buildings moved and restored at the site. The Hughes House was built in 1845 and moved from Rocky Mount and restored to its original condition. There is also an 1884 Heath log cabin on the grounds. There is a little something for everyone on this garden tour. Wiener says this year’s tour has shown a lot of diversity. If you are interested in exploring the beautiful gardens on the tour, you can purchase tickets by calling the Master Gardeners at 318-698-0010. Tickets are also available at Citizens National Banks. They are $10 when you buy in advance or $15 on the day of the tour. The Harvill’s garden in River Bluff on Red River is filled with Little Gem magnolia, Eagleston holly, foxtail fern, pink hidden ginger, hibiscus, lantana, roses, canna lily, muhly grass, begonias, bottle brush, palms, guara and lamb’s ear. They also have a secret patio tucked into a shady cove with a special Queen Centaur bench. Around the corner in back is a great river view with a climbing rose, two loquat trees, vinca, crape myrtle, hibiscus, butterfly bush, caladiums, basil and peppers planted in the herb garden. Walk up the driveway alee of cedar trees and Indian hawthorns to 4+ acres planted with cypress trees. Stinson has used old windows and mirrors to construct an artistic fence with ornamental grasses and roses between the fruit tree orchard and the lily beds. Through an arbor enter a fenced butterfly garden containing primroses, bananas, lantana, butterfly bush, roses, redbud and birdhouses surrounding the pool and patio. Sue & Al Wyche Garden, 211 North Beach Dr. 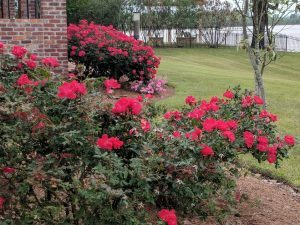 In front of the house in River Bluff on Red River there is a large stand of lavender muhly grass blowing gently in the breeze, elephant ears and a pretty stone patio with a beautiful fountain, Eagleston holly and seasonal plantings leading to the front door. On the south side, follow the path planted with yucca with red blooms and ornamental grasses, river birch and Sweet Bay Magnolia. 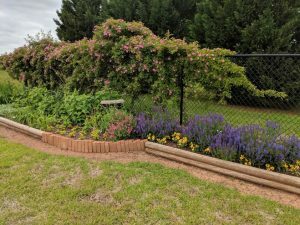 The garden includes a Savannah Girl statue, a pink Rose of Sharon attracting bumblebees, Peggy Martin roses, cannas, butterfly bush, Grancy Greybeard, vitex, hibiscus, Mexican petunias, hybrid daylilies and redbud trees.